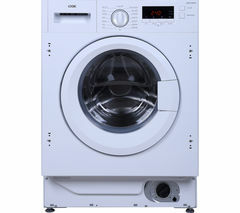 However much washing you need to tackle, our Logik washing machine range is here to help. Available in a range of widths and capacities to suit your space and washing load needs, you’ll find your perfect fit. Packed with clever tech and wash programmes, including quick-wash functions that get your washing done in just 15 minutes, these machines ensure your fabrics are properly cared for with minimum fuss. With energy ratings from A+ to A+++, Logik washing machines are eco-conscious, so you can save money and energy with every wash. Choose from classic white, bold black and sleek silver finishes to suit your home decor, or seamlessly conceal your appliance with an integrated washing machine. Capacities vary from 6kg to 10kg load handling, so you can choose a machine that caters for you and your family’s washing needs. Spin speeds reach up to 1400rpm, leaving your clothes drier out of the wash to reduce on drying time. Models like the L1014WM17 Logik washing machine feature a special pearl drum pattern to ensure that your clothes are always cleaned gently, avoiding and snags and pulls in the fabric. With strong, rigid cabinet build, these machines are designed to reduce vibration and increase stability, for a quieter wash. Logik’s Allergy Safe mode helps to eliminate bacteria and allergens, great for households with pets. Clear LCD displays mean you can control your settings with ease, including the time delay function that allows you to control when your machine begins a programme. Whether you want your washing done for when you get up in the morning or when you get home from work, timer functionality makes it easy to fit your laundry loads around your life. For a wider selection of cleaning programmes, capacities and designs, see our Bosch washing machine range.